Aguila Ammunition. I’ve been shooting a bit of it lately and I have some observations. For a Mexican Import, it’s really not bad stuff. It seems to be loaded pretty consistently and groups decent enough. It’s not as tight as Blazer Brass or Federal white box stuff… but it’s not bad. It’s somewhere in a C+ to B- grade I think. 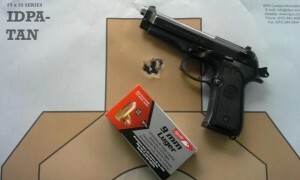 Which for FMJ range ammo for practice, isn’t bad at all. The downside is that the stuff shoots dirt as hell. I’ve noticed more smoke and far more fouling afterwards. Clean up after shooting this stuff shows a lot more carbon and residue than most commercial ammo. But hey, with ammo being not as easy to find as it is now… I’ll take some Aguila, no problem. I like it far better than Remington UMC stuff.